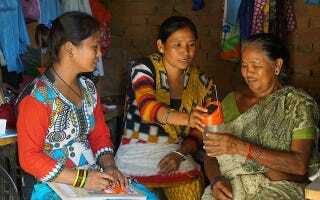 In the last two years two schemes designed to encourage women to bring the solar revolution to parts of rural India and Nepal have won international Ashden Awards, which bring the organizations involved £20,000 (US$26,360) each in prize money and a lot of guidance to improve and extend their businesses. For customers who have no chance of a grid connection, solar lanterns and solar home systems bring clean electric light and phone charging, often for the first time. Even those who are connected to the grid use the products as a back-up during the frequent blackouts, or for attending to crops and animals after dark. The winner of the 2016 Ashden Award for clean energy for women and girls, Frontier Markets, runs an organization called Solar Sahelis in the Indian states of Rajasthan and Andhra Pradesh. Solar torches are brighter and more reliable than battery-powered ones, and save users from running down phone batteries through using mobile phones for outdoor light. These are the latest in a series of Ashden Awards aimed at helping women and girls. Since the Awards were founded in 2001 Ashden has helped more than 200 enterprises around the world, which so far have collectively improved the lives of some 80 million people, saving more than ten million tonnes of CO2 emissions every year.